In order to meet those specifications, DaimlerChrysler also specified the only CNC that could make it happen: OpenCNC® software from MDSI. Unlike traditional CNC controls, OpenCNC requires no proprietary hardware or motion control cards. Combining a soft CNC, soft PLC and HMI in one application, OpenCNC reduces engineering costs and enables machine tool builders to bring products to market faster, because it leverages standard software development tools and standard off-the-shelf PCs. At Kasper, a post-processor gauge system was added to each of the DaimlerChrysler machines. With traditional, proprietary controls, adding the gauge would have required a separate PC and a significant amount of separate, additional hardware. Using OpenCNC's open architecture, all-software design, a post-processor gauge system was added to each of the DaimlerChrysler machineson the same PC and virtually no additional hardware. 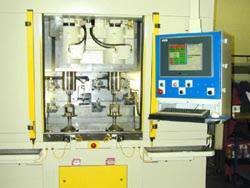 For the machine tool builder, the cost savings were substantial. The MDSI control also allowed DaimlerChrysler to have several custom features added to the control user interface, such as additional operator help screens. Turning the bearing surface of an axle. Very high precision. Very high surface finish requirement. Servo update rate is 2 ms (milliseconds).